Research & Education Association, 9780738611945, 256pp. The warm and witty authors of English the American Way: A Fun ESL Guide to Language and Culture in the U.S. are back with the second book in the series, Celebrate the American Way, another fun ESL guide to English language and culture. 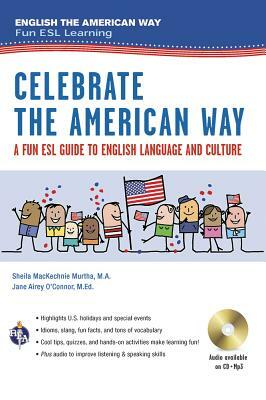 Our ESL author experts (Sheila MacKechnie Murtha and Jane Airey O'Connor) give English language learners all the must-know vocabulary, common expressions, and wacky idioms that help explain the major celebrations and social customs in the United States. You'll have fun improving your English language and grammar skills. Along the way, quiz yourself with fill-in and matching exercises as you learn about commonly confused words, adjectives, and synonyms. Practice speaking English like an American until you're perfect Improve your listening and speaking skills with the dialogues included on our audio CD and Mp3 download. No matter what the season, Celebrate the American Way is an excellent resource for ESL students and teachers, English language learners, and professionals of all ages and all nationalities. Don't miss the first book in the series... English the American Way: A Fun ESL Guide to English Language and Culture in the U.S.
About the AuthorsSheila and Jane have been colleagues and friends for... well, let's just say a long time. As English as a Second Language (ESL) teachers, they worked together on lots of projects... and had lots of fun as they worked. A partnership was born! Together, Jane and Sheila have teaching credentials in several states and two continents. With years and years... and years... of experience (they just don't want to count them all, ha! ), they have taught ESL to little kids, big kids, university students, adults, company executives, and other teachers in the U.S. and Europe (both online and in regular classroom settings). Both Sheila and Jane have served as members of the New Jersey Department of Education Advisory Committee for ESL/Bilingual Education. They've facilitated online ESL training courses for teachers through the NJ DOE professional development program. Sheila has held several leadership positions scoring teacher candidate responses for an international testing company, and Jane has written ESL test questions and rated English as a Foreign Language exams for another internationally recognized testing company. (They teach, they test, they score!) They have won many awards for excellence in teaching, including two Teacher of the Year awards, and corporate citations for excellence. They've given numerous presentations and have written curriculum and syllabi for diverse ESL populations. Add to this some fun teaching projects in Spanish, public speaking, drama, writing... and, we're not kidding, even soccer skills and you've got two writers who know how to have a good time writing a book! Jane is now the Director of ESL Services for Emory College of Arts and Sciences in Atlanta, Georgia. Sheila is a lecturer in the English Language Program at the University of Pennsylvania, and continues to teach, write and consult in New Jersey and New York. Although they live several states away, both are happy to find time to work together on fun projects... like this book!